Wouldn’t it be great if money grew on trees? But since it doesn’t, everyone has to learn how to earn and manage money in order to live and it’s never too early to start. 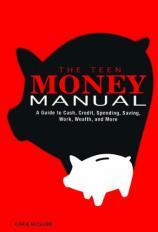 This book offers today’s teens the best and most up-to-date tips on how to make money, how to spend it, how to invest and save it, and how to protect it. Learn how to land that first job, figure out your paycheck, and negotiate a raise. Discover how to stretch your money to cover all of your needs and (at least some of!) your wants. Learn to be a savvy saver to vastly improve your life. Really! Once you’ve started to accumulate property and money, you’re not done managing your financial life. Far from it! Find out what it takes and how much it will cost. Read a sample.